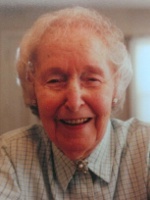 ALBANY – Sophie Pilitowski Niemiec, 97, of Albany, passed away peacefully on Friday, May 9, 2014 at the Teresian House. Sophie was born in Burlington, CT, but lived most of her life in Port Chester and Albany. Family was the center of Sophie’s life. She took joy and pride in creating a home where family gathered to enjoy her wonderful cooking, play cards and laugh. Sophie was predeceased by her husband of 67 years, the love of her life, Stanley Niemiec, in 2010 as well as by siblings and their spouses, Cecilia Legutko (Walter), Adele Bierut (Martin), Casimer Pilitowski (Regina), Jennie Gutowski, Veronica Pilitowski, and brothers-in-law Silvio Brighenti and Robert Phenix. She will be missed by her sisters, Theresa Brighenti of Avon, CT and Elizabeth Phenix of Simsbury, CT, her daughters Mary Thomas (Bruce) of Holly Springs, NC, and Theresa Ewell of Albany; her grandchildren Scott Thomas (Heather), Keith Thomas (Kelly), Catherine Ewell (Matthew Barton), and Michael Ewell (Arielle); and by her great grandchildren Trenton and Hudson Thomas, Madalynn and Lillian Thomas, and Elijah Ewell, as well as many nieces and nephews and their children, all of whom she loved and cherished. The family would like to express their gratitude for the loving care and support provided by the staffs of the Teresian House and the Marjorie Doyle Rockwell Center. A Mass of Christian Burial will be celebrated Monday morning at 9:30 am in the Parish of Mater Christi, Hurst Ave., Albany. Relatives and friends are invited, and may call at the Hans Funeral Home, 1088 Western Ave., Albany, Sunday from 4-7 pm. Interment will be in St. Agnes Cemetery, Menands. In lieu of flowers, memorial contributions may be made to the Mater Christi School, 35 Hurst Ave., Albany, NY 12208. To leave a message of condolence for the family or obtain directions to the funeral home, please visit www.HansFuneralHome.com. May she rest in peace and you find comfort in your memories. You are in my thoughts and prayers.